Steven (Chicagoland, United States) on 18 January 2010 in Plant & Nature and Portfolio. 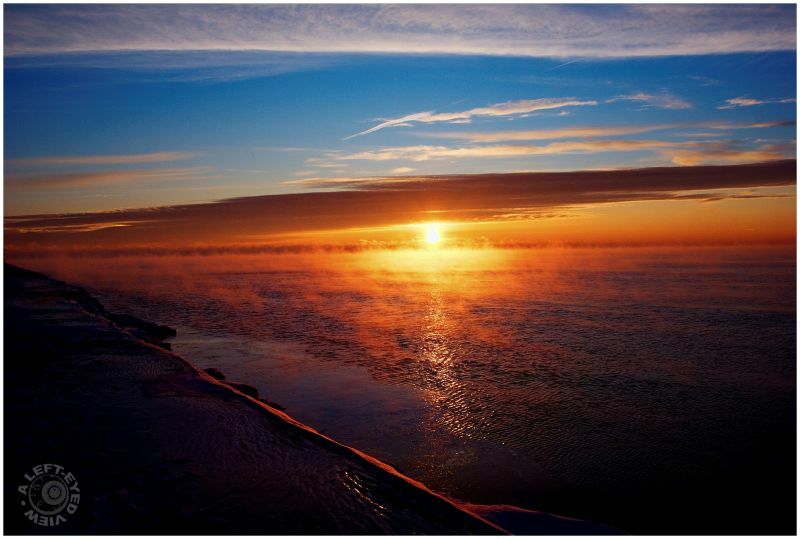 One of the first shots of the sunrise that I captured as I finally arrived beyond the breakwater and was exposed to the open waters of Lake Michigan. The vast area of steamy water was a sight to be seen as you'll see in tomorrow's finale. Photo taken on January 10, 2010. Love this series. It has really been beautiful. wow.. this is very divine..
Beautiful photography, well composed, bravo! Incredible light and color - awesome work - 5 stars on this one! Sensational shot . . I could see this on the cover of a SF novel ! Steven, you have given us who don't live in the frozen Northlands a really different perspective on sunrises over the water. Thank you for this series; I doubt if I will ever experience something cold and dramatic as this first-hand, but through your photos, I will have all but "been there" in person. Excellent. You got the worm in spades! Beautiful.